These are the experiences, which make you question the purpose of your life. 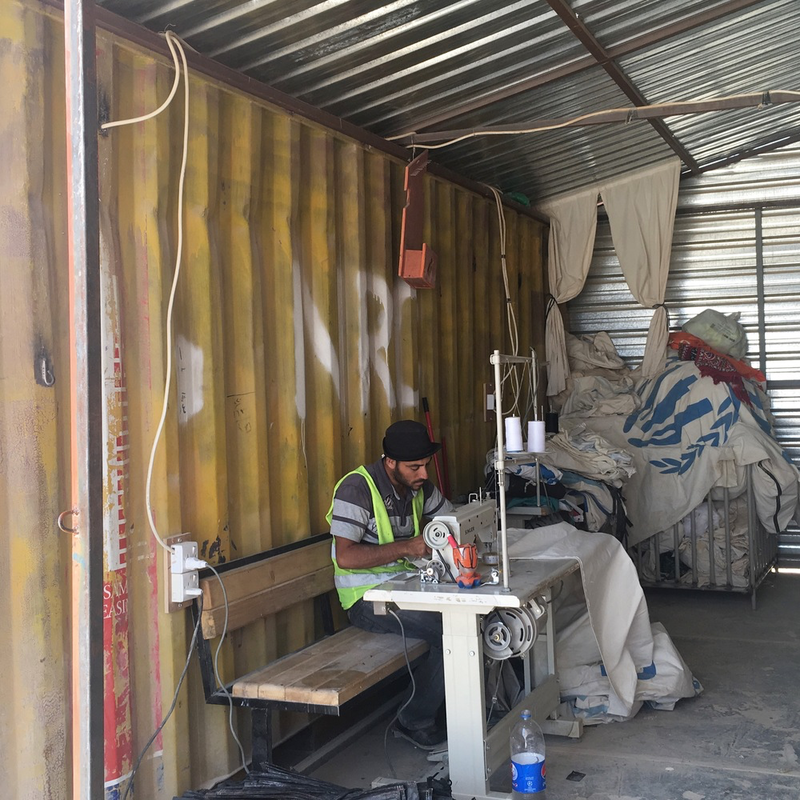 As we drove along the surrounding camp wall of Za’atari refugee camp in 40-degree heat, people squatted in the width of its narrow shadow, their torsos hugging the perimeter. They were surfing on the edge of the base camp Wi-Fi, in order to communicate with relatives they can no longer be with. Our first meeting with the manager of Za'atari Camp was enlightening. Nothing you can imagine, is how things actually are - he told us that the refugees have taught them the conditions for dignified living. The camp is built day-by-day, by the refugees themselves, and the UNHCR are in service to them. To express both the abundance of skills the refugees have (engineers, teachers, scientists, farmers, economists, athletes, tailors, barbers, chefs) and the conditions for their lives, one of his his opening lines to us referred to the idea of “how to be an entrepreneur in hell”. The facts are unprecedented in modern times - home for now, to almost 80,000 persons of concern, living off 35 litres of water per person, per day (1% of USA consumption), with 20 weddings a week, 3,000 ‘pop-up’ shops, five hospitals, 24 schools, 55,000 loaves of bread baked each night, 60-70 children born a week and a daily running cost, met by the UNHCR and the Jordanian Government of £300,000 and all in 5 years. What the Jordanian Government do for refugees will put the UK to shame - most likely, forever. The Jordanian people have made a commitment to rebuild Syria through an investment in its people, now. Every refugee wants to go home, and Jordan wants to help them create the possibility of that happening one day. Key also to the current work of the UNHCR and all the other agencies present, is that there are more urban refugees living outside the camps, than within them now and they also need our help. We spent our first day in Jordan at Azraq Camp - this has now taken over receiving new refugees, as Za’atari is at capacity. The biggest challenge however, is the attempt to connect life inside the camps to the life outside of them, and not to create an unbreakable dependency. The UNHCR want to find a way to help Syrian’s rebuild both their inner and outer worlds, following the horrors which ignited their mass fleeing. We visited community centres - the places were our own offers of imagination, help and solutions may be best delivered. We met with the President of Al al-Bayt University which is the closest university to the camps, we visited families in their homes (notable for the absence of husbands and immense generosity of tea and cakes), vocational training centres, the UNICEF engineers who supply energy and water, wedding shops, and groups of women who sew and make. We wanted to know what they needed, what had worked and failed so far, and what the main challenges going forward were for everyone. Two particular moments sparked what our future work with the UNHCR and the refugees would look like. The first was triggered, by being shown around the tent recycling and and supplies depot, run by the Norwegian Refugee Council. Once sheltered by tents, almost every person in Za’atari is now housed in a ‘caravan’. There is a vast landscape of metal houses, each of which hold well sorted, packed and stored components of every thing that make them up and along side, sprawled on the scorched desert floor outside, what they have now re created out of these past textile shelters; prams, swings, slides, baby walkers, storage covers and even a lifesize ‘Sponge Bob’. The second was sitting in on a Maths lesson with the TIGER girls. The group is made up of 1,200 young girls who are being loved back into education. In part, to help address a connected problem of marriages at very young ages, as well as to allow them to experience how what they know and discover together, can shape who they are and become. They had prepared a short play in English and spoke about their love of recycling and what they had found, gathered and re purposed - this, despite there being no recycling initiatives in the region at all. We came away with a series of ideas to work upon that range from technological fixes, to the slower work of healing through collaboration across cultures, making and friendship. In a place full of people for whom geography and circumstance has dealt a blow none of us here can imagine, there is much to be inspired by. Out of the black shatter of war, and equal in the trauma that unites them, refugees show us how to live in a way, where every single action matters and everything in a lived day, is an utter achievement.